Imagine what it is like to walk around with a vaguely sick feeling in your stomach most or all of the time, which can quickly turn into a sharp ache when someone approaches or the exam time gets closer. Imagine a tight band around your chest which is there more than not, which makes a deep breath difficult generally, or almost impossible when something triggers the band to tighten its grip fiercely. Imagine what it’s like to be going calmly along in life and suddenly feel a tidal wave of fear takes over that brings on a feeling of doom, sweaty palms, a pounding heart that is racing, and a brain that feels like it just might explode with racing thoughts. You feel like you are going to die--literally. Many of you don’t have to imagine these…because you’ve experienced them. Perhaps you never have to imagine them because you experience some anxiety all the time. Anxiety exhausts people in how much effort it takes to be anxious, and then to cope with the feeling of anxiety. Anxiety can sometimes be a result of dealing with recent trauma, trauma in the past, or may have such subtle origins it is difficult to "tease them out". Anxiety is so difficult to experience that many people find themselves avoid events, places and people which create the anxiety. Then these difficult feelings can be avoided. Others will work "double time" to avoid feelings by making sure everything is perfect, or planning ahead. All of this disconnects you from others--which then further increases the uncomfortable feelings of anxiety. When you avoid situations to avoid the anxious feelings that happen before and during them you miss out on going out with the girls, or taking that course, or asking her out on a date, or talking to your boss about new opportunities. Sometimes even little things are missed out on…talking with your spouse about the credit card debt that is accumulating, or letting someone know that you were upset by what s/he did. Counselling can help a person discover the role of anxiety in their inner world…to understand their anxious part better, and to work with it to stop the anxious part from “hijacking” the situation and taking over, stopping a person from doing what it is that s/he really wants to do. Counselling can break the cycle of anxiety controlling your actions and your life experiences in this world. Counselling can help you figure out ways of being less anxious—which leaves you with more energy to focus positively on the good things in your life. 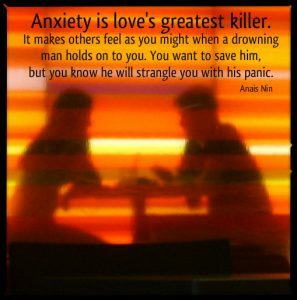 What would it be like for you to develop a different relationship with anxiety?